Many researchers believe that physics will not be complete until it can explain not just the behavior of space and time, but where these entities come from. “Imagine waking up one day and realizing that you actually live inside a computer game,” says Mark Van Raamsdonk, describing what sounds like a pitch for a science-fiction film. But for Van Raamsdonk, a physicist at the University of British Columbia in Vancouver, Canada, this scenario is a way to think about reality. If it is true, he says, “everything around us — the whole three-dimensional physical world — is an illusion born from information encoded elsewhere, on a two-dimensional chip”. That would make our Universe, with its three spatial dimensions, a kind of hologram, projected from a substrate that exists only in lower dimensions. This ‘holographic principle’ is strange even by the usual standards of theoretical physics. But Van Raamsdonk is one of a small band of researchers who think that the usual ideas are not yet strange enough. If nothing else, they say, neither of the two great pillars of modern physics — general relativity, which describes gravity as a curvature of space and time, and quantum mechanics, which governs the atomic realm — gives any account for the existence of space and time. Neither does string theory, which describes elementary threads of energy. 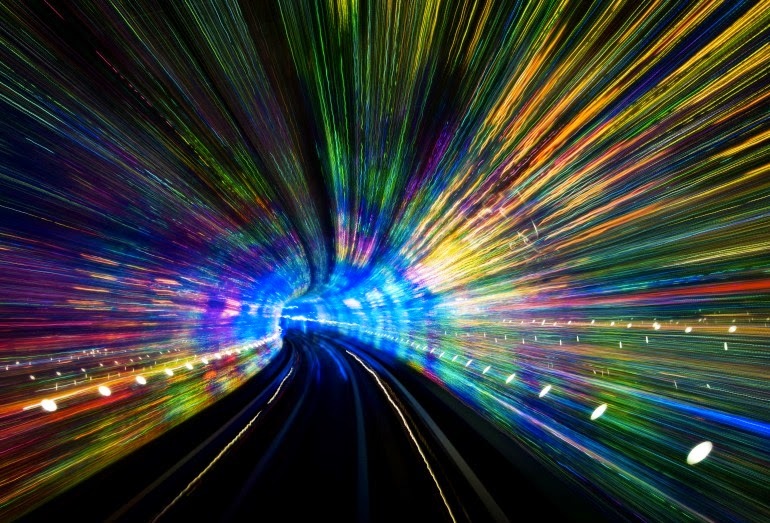 Van Raamsdonk and his colleagues are convinced that physics will not be complete until it can explain how space and time emerge from something more fundamental — a project that will require concepts at least as audacious as holography. They argue that such a radical reconceptualization of reality is the only way to explain what happens when the infinitely dense ‘singularity’ at the core of a black hole distorts the fabric of space-time beyond all recognition, or how researchers can unify atomic-level quantum theory and planet-level general relativity — a project that has resisted theorists’ efforts for generations. “All our experiences tell us we shouldn’t have two dramatically different conceptions of reality — there must be one huge overarching theory,” says Abhay Ashtekar, a physicist at Pennsylvania State University in University Park. In 1995, Ted Jacobson, a physicist at the University of Maryland in College Park, combined these two findings, and postulated that every point in space lies on a tiny ‘black-hole horizon’ that also obeys the entropy–area relationship. From that, he found, the mathematics yielded Einstein’s equations of general relativity — but using only thermodynamic concepts, not the idea of bending space-time . In 2010, this idea was taken a step further by Erik Verlinde, a string theorist at the University of Amsterdam, who showed that the statistical thermodynamics of the space-time constituents — whatever they turned out to be — could automatically generate Newton’s law of gravitational attraction. And in separate work, Thanu Padmanabhan, a cosmologist at the Inter-University Centre for Astronomy and Astrophysics in Pune, India, showed that Einstein’s equations can be rewritten in a form that makes them identical to the laws of thermodynamics — as can many alternative theories of gravity. Padmanabhan is currently extending the thermodynamic approach in an effort to explain the origin and magnitude of dark energy: a mysterious cosmic force that is accelerating the Universe’s expansion. Other physicists are looking at laboratory tests. In 2012, for example, researchers from the University of Vienna and Imperial College London proposed a tabletop experiment in which a microscopic mirror would be moved around with lasers. They argued that Planck-scale granularities in space-time would produce detectable changes in the light reflected from the mirror (see Nature http://doi.org/njf; 2012). Even if it is correct, the thermodynamic approach says nothing about what the fundamental constituents of space and time might be. If space-time is a fabric, so to speak, then what are its threads? One possible answer is quite literal. 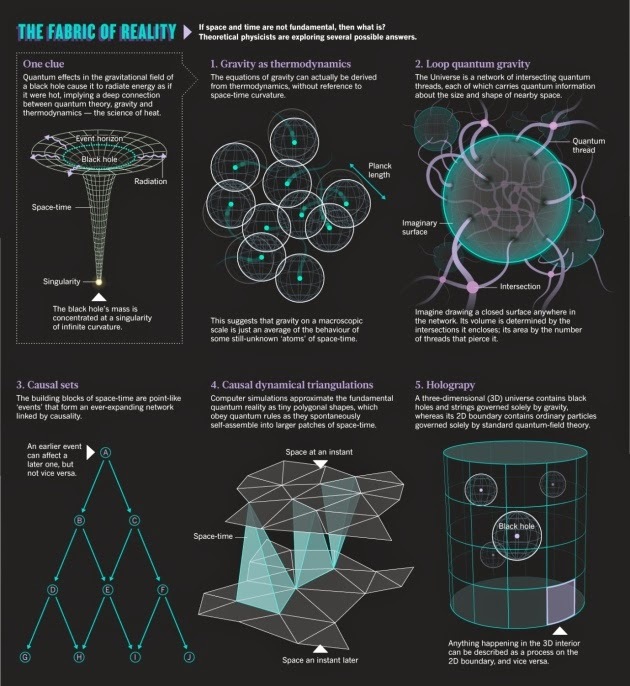 The theory of loop quantum gravity, which has been under development since the mid-1980s by Ashtekar and others, describes the fabric of space-time as an evolving spider’s web of strands that carry information about the quantized areas and volumes of the regions they pass through . The individual strands of the web must eventually join their ends to form loops — hence the theory’s name — but have nothing to do with the much better-known strings of string theory. The latter move around in space-time, whereas strands actually are space-time: the information they carry defines the shape of the space-time fabric in their vicinity.